Could it be true? Healthy bacon recipes? Yes! We promise, “bacon” is not a curse word among dietitians! As lovers of great tasting food, we know that bacon is one of the foods that contains amino acids that produce the savory umami taste that makes bacon so irresistible. So, how is it possible to be a bacon-lover while watching your waistline or trying to eat a healthy diet? 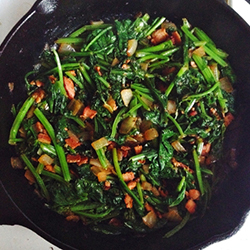 The key is to use bacon strategically in your cooking—as a topping, garnish or flavor enhancer. A small amount of bacon will go a long way toward enriching the flavor profile of your dish without compromising the nutritional merit—especially when the other ingredients are whole grains, lean proteins, and vegetables. Post by Brianna Farrand, a graduate student in nutrition at Columbia University and Appetite for Health intern. This recipe is full of flavor and everything gets thrown into one pan… a bonus because quick prep and clean-up mean it’s easy enough for a weeknight dinner. 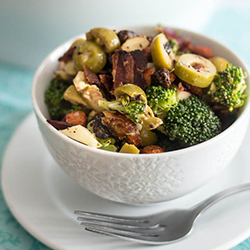 The addition of crispy bacon makes this salad feel decadent—even though the broccoli, apple, and almonds make it full of fiber and quite healthful. This salad would travel well as a packed lunch. 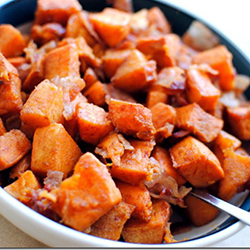 The perfect side dish for a fall meal, the savory bacon complements the natural sweetness of the roasted sweet potatoes in this dish. Sweet potatoes are an excellent source of unprocessed carbohydrates, as well as vitamins A and C. Keep the skin on for extra fiber! 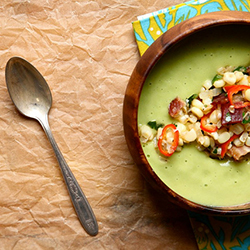 Blended avocado makes this soup creamy and velvety—and just the right base for chunky toppings like corn, jalapenos, and bacon. Bacon-egg-and-cheese is one of those combinations that’s considered “classic” for a reason—it’s delicious! 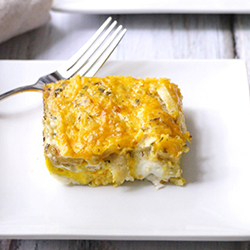 By skipping the cream or crème fraiche that’s often used in frittatas and adding sliced apples, this recipe is a healthier version and a twist on the classic flavor combo. Cut it into squares and wrap them up for pre-portioned convenience during the week. Mustard greens are far more nutrient-dense than the typical side salad, but they tend to taste somewhat bitter. 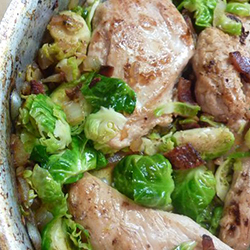 With this recipe, the fat in the bacon mellows out the bitterness, producing a flavorful, balanced dish that’s low in calories and high in antioxidants… no salad dressing required! Smoked paprika and two slices of bacon deliver the perfect smokiness to this soup. 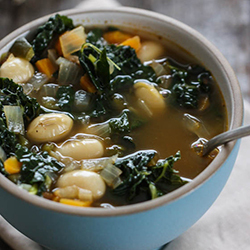 When the temperature outside begins to drop, there’s no need to turn to heavy, comfort food—this homemade soup feels cozy and satisfying, while still providing excellent nutrition from the vegetables and beans. With such great visual appeal—each bundle of asparagus (or green beans!) 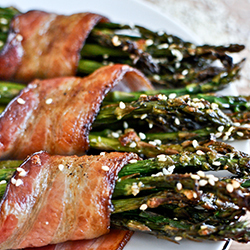 gets its own unadulterated strip of bacon—this recipe would work well as an elegant appetizer or side dish. 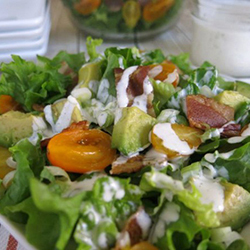 If you’re trying to lose a few pounds, or even just maintain a healthy weight, you may think there’s no room in your diet for the BLT you’re craving. The two slices of bread slathered with mayo make the original high in calories and fat, but ditch those two ingredients, pump up the L&T with some green onions and avocado, and all of a sudden, you can satisfy your craving without totally indulging. 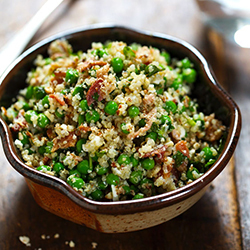 Crumbled bacon pairs well with the fresh herbs in this protein-packed quinoa salad. This is a great make-ahead dish because the salad soaks up the dressing and becomes even more flavorful after a day or two in the fridge. Ninomiya K. Umami: A universal taste. Food Reviews International 2002; 18:23-38.